Mexico’s landslide election of leftist, Andres Manuel Lopez Obrador, is a sweeping rebuke of working class poverty, corruption, and a generation of rule by a party that had lost the support of the Mexican people. Mexico saw an election with the most votes in history, with over 50% of the vote going to Lopez-Obrador. With a large majority of seats in the house and senate going to his Morena Party, there is good reason to hope that AMLO will be able to accomplish a lot, especially in the realm building an internally-based economy and overcoming endemic corruption. There is also good reason to hope that Mexico’s Labor movement will also develop when the new president takes office in December, and that will bring relief to U.S. workers as well. And there is good reason to hope that Mexico’s Labor movement will also develop when the new president takes office in December. 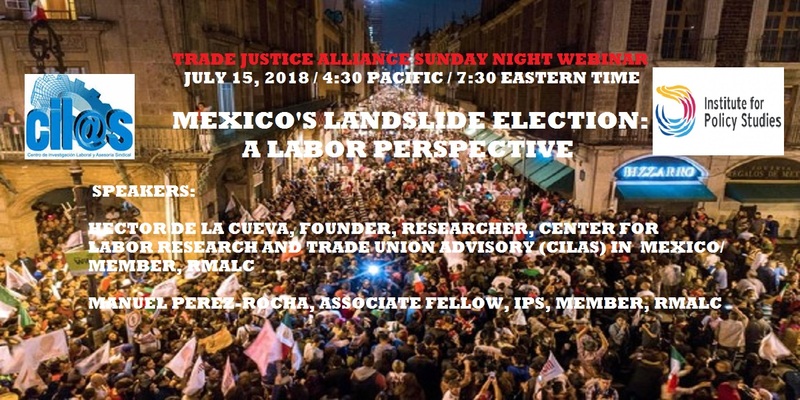 We look forward to hearing from two trade experts on the expected implications for Mexico’s political and labor movement in the wake of such an historic election. Trade Justice Alliance is pleased to welcome Manuel Perez-Rocha, Associate Fellow at the Institute for Policy Studies in Washington, D.C. and a member of the executive committee of Mexican Action Network on Free Trade (RMALC). He is a Mexican national who has led efforts to promote just and sustainable alternative approaches to trade and investment agreements for two decades. We are also excited to welcome for the first time, Héctor de la Cueva, the founder and Coordinator, General for the Labor Research and Trade Union Advisory Center (CILAS) in Mexico and member of the National Coordination of the Mexican Network of Action against Free Trade (RMALC).